I still lay about seo should still continue to study diligently in order to understand more about seo,,,,!!! I would have thought by now that Link Assistant would have included functionality for article marketing and blog posting, given that these are the two strongest ways to drive links and PR value etc. I've made blog posts to a couple of places and these have leap-frogged me up the rankings compared to the months of link building I tried to do through the reciprocal link tool in link assistant. Using the link forms and link pages, keeping it up to date felt like a huge piece of labour with not a huge amount of return. I in fact ended up not using it and downloaded a couple of free tools which do a great job. I'm assuming you don't work for Link Assistant but this is a big gap in the SEO Powersuite for me. I still think this site is brilliant! This post has further enlightened me on what to do to get my site to the top of some search engines. However when it comes to buying traffic effective links i get confused. Some say the sites from where the links comes must be relevant to your site and some says what matters is page ranking and relevance doesnt matter. 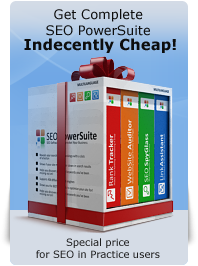 If you are buying links (ads) for traffic, that is basically the way it is meant to work and is approved by the SEs, then all you need to consider is how rich the site is in traffic. However if you wish to buy links for SEO purposes, like some do, then you need to pay attention to relevance of the site. Links from irrelevant sites might get devalued in terms of SEO (they might look suspicious and get easily detected as paid links) and will only be able to bring you traffic, no link juice. So this is what you need to keep in mind. One problem I seem to have is changing the content, keeping it fresh. If you have a good content - no problem. It is not necessary to make changes every day. Set up your Twitter to automatically feed to your site. Constant Changes! Thanks for your advice, i have free classified site http://getadsoline.com. Please give some advise how to make attractive my site. Good advice, i will follow. #728 2009-10-28 00:59:55 Larry Kenebrew Jr.
Great advice on SEO. I'm using your techniques with my site. yes i agree with you.content is everything and it is a key to success! Thats right, content is everything in SEO. This is my first comment on your blog. I’ve just created my Website about Various car hiring and I think getting traffic needs some patient. in 2014 even more and more!